Who doesn’t love the flavors of pizza that meld together making it quite simply one of our most beloved dishes? My family loves pizza, so I was looking for a healthy, non-traditional way to incorporate the divine flavors of pizza with a veggie. 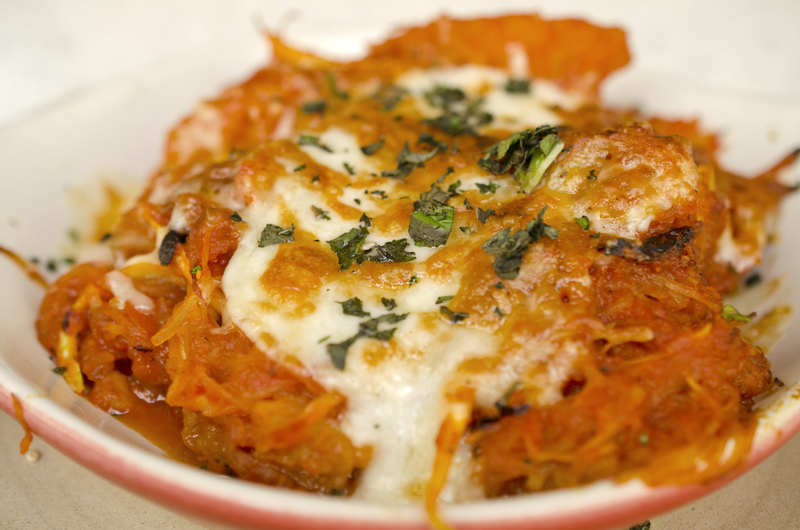 This Spaghetti Squash Pizza Casserole does just that. I frequently buy spaghetti squash and put them in the oven to steam any time I already have the oven on. It cuts the preparation time for this recipe in half. This recipe also does well if it’s prepared ahead of time and frozen in a casserole dish, making it easy to pull out of the freezer and into the oven. Place cut side down in a baking dish with ½” water, cover and put in oven to steam for 30 minutes or until you can poke through the squash with a fork. While squash is steaming, put onion and coconut oil in a sauté pan over medium heat and allow the onion to cook until translucent, about 5 minutes. Add ground beef and cook until the beef is no longer pink, then add pizza sauce, garlic powder, paprika, Italian parsley, Italian seasoning, salt, and pepper. Once squash has steamed, allow the squash to cool, then “thread” the squash into an 8×8 baking dish. Mix the spaghetti squash, beef mixture, and Parmesan cheese in the baking dish. Add the whisked eggs and mix well, the sprinkle additional parmesan cheese and basil on top. Place in the oven uncovered and bake for 40 minutes or until the cheese begins to bubble. Allow to sit for 10 minutes before digging into it.